We just achieved a key milestone in the carbon price campaign. On May 18th Councilmember Mary Cheh finally presented a draft proposal for a carbon price in DC! The proposal comes on the heels of the DC Council introducing a bill requiring 100% of the District’s electricity to come from renewable sources by 2050. Councilmember Cheh’s proposal brings us one step closer to enacting a strong and fair carbon fee-and-rebate policy, and we are grateful for her leadership. However, it must be strengthened before being introduced and passed into law. The proposal is still in draft form, so specific allocations of the revenue raised in this proposal will undoubtedly change. At this time, we are focusing on the effectiveness of the proposal in terms of reducing fossil fuel emissions. The Councilmember’s current draft cuts in half the most important numbers: the level of the carbon price itself, the economy-wide coverage, and the emission reductions that follow. With a fee starting at only $10 per ton of carbon dioxide, Councilmember Cheh’s proposal falls along the lines of many others being implemented around the globe. And akin to those, it is not enough. The recommended carbon price to meet the high end of the Paris Agreement (2.5 degree Celsius warming) is $230 per ton of CO2 in 2020. A higher carbon price is cited as being needed to hasten the transition to clean renewable energy sources and to improve energy efficiency. Our proposal calls for a fee that begins at $20 per ton and increases $10 per year, to eventually reach $150 per ton by 2032. One of the leading differences between the two proposals is that Councilmember Cheh’s would only place a carbon fee on oil and gas combustion. It completely omits the electricity sector from paying a fee. Fossil fuels are a main source of energy for electricity generation in the district. In order to ensure a swift transition to clean energy across the economy, it would be more effective to apply a carbon price across all sectors, rather than segmenting them with different policies like an RPS. Under the coalition proposal, the electricity sector would decarbonize decades faster than under Councilmember Cheh’s. DC has the goal to reduce greenhouse gas emissions by 50 percent by 2032, and the coalition proposal would put us on track to achieve those goals. However, Councilmember Cheh’s proposal cuts the carbon price in half and lessens its scope, inevitably diminishing emission reductions. 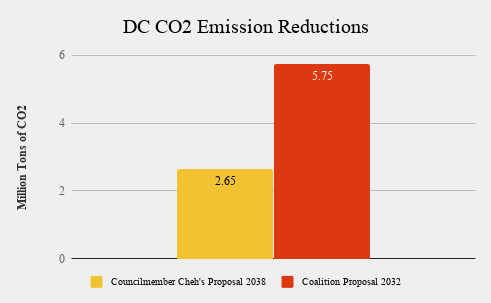 The Put A Price On It DC proposal reduces CO2 emissions from natural gas and oil by 5.75 million tons by 2032 (not including the emissions reductions from electricity), whereas Councilmember Cheh’s proposal only reduces it by 2.65 million tons by 2038. We cannot afford to let that mass of greenhouse gas emissions escape into our atmosphere. We are on the brink and every ton of CO2 emitted into our atmosphere counts. We’re going to work closely with Councilmember Cheh to mold this proposal into an equitable carbon pricing policy that catalyzes reductions in greenhouse gas emissions, encourages innovation and clean renewable energy, and is fair to all DC residents. There are still many factors of this proposal to be determined and we must keep up the pressure to ensure a rebate to ratepayers, the details of which are still to be determined by a commission. On June 5th we will be having a press conference to urge our councilmembers to continue making progress on a fair and equitable carbon price and to push for the bill to be introduced. In the meantime, you can send a message to Council Chairman Phil Mendelson expressing your support for a strong and fair carbon price today. Read on for more details comparing our proposal with Councilmember Cheh’s proposal. Per the Clean Energy DC plan, this would require the electric utility to procure 70% of the Standard Offer Service via long-term renewable PPAs, phased in over three years based on the percentage of supply contracts that are up each year. The RECs accompanying the renewable energy would also be purchased and used for compliance with the RPS. Per the CleanEnergy DC plan, limit the area from which RECs may be purchased for compliance with the RPS to the PJM Fee applies to electricity at same rate as other sectors, which increases efficiencies. See analysis below on necessary amendments to any proposed 100% RPS. Green Finance Fund The first $30 million raised would go to the Green Finance Authority, after that the Green Bank would receive $10 million per year for 4 years 20% of the revenue is directed to greenhouse gas reduction programs, with a focus on energy efficiency and supporting greener buildings, as well as the installation or retrofit of HVAC and other large building systems. Minimizing administrative costs of the program. 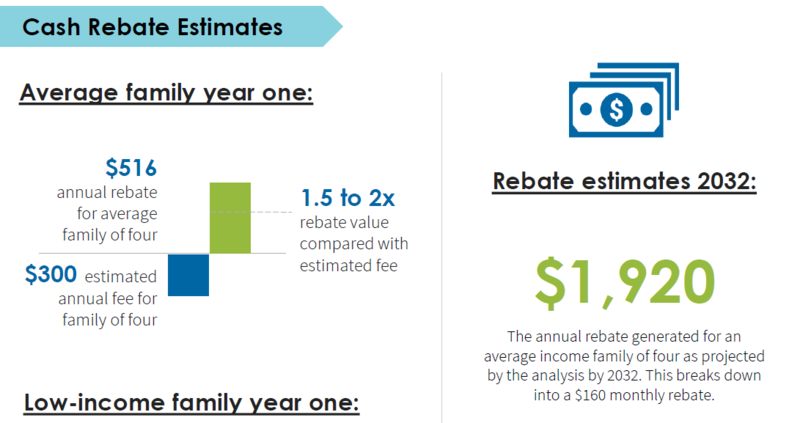 75% of revenue rebated to all residents, with an enhanced rebate for residents below 200% the federal poverty level. See below for principles to which a commission must adhere. We are concerned that Cheh’s currently proposed $10/ton starting price with $30M allocated for the Green Bank would leave zero revenue for any other purpose, including the rebate. $X million per year for a tax deduction for energy efficiency retrofits in commercial buildings Under the Coalition proposal, 5% of the revenue is directed toward operating-cost relief for small businesses. The Coalition asks that CM Cheh’s proposal specify that funds appropriated to the Green Finance Authority and/or SEU, master-metered units, and commercial tax credits can be used for both energy efficiency AND for investments in building electrification (switching from gas/oil to electric space/water heating and cooking). The proposal should also specify where money goes from either parking fees or a fee on motor fuels if a neighboring jurisdiction acts. We applaud Councilmember Cheh’s proposal to restrict the catchment area for qualifying RECs under the RPS to the PJM alone, as well as her proposal to require 70% of the SOS be procured by long-term renewable PPAs. However, the Coalition proposal seeks far larger reductions from a comprehensive carbon price on electricity. In short, a 100% by 2050 RPS policy will not help the District achieve its 2032 climate and energy goals. This approach leaves 80% of electricity unaffected now, and does not strengthen our existing efforts to decarbonize as mandated by the 50% by 2032 RPS. If the Council is intent on reducing electricity emissions via a new RPS, the target date must be significantly sooner. The design of the current 50% by 2032 RPS presents another opportunity for increased emission reductions. There need be no three-year pause beginning in 2020, when clean energy will comprise 20% of the electricity mix. Instead, the RPS could reach 30% by 2023 and exceed 50% by 2032. In order to better detail the specifics of residential energy use compensation, the Coalition is supportive of a bill that would allocate 75% of revenue to residential rebates, and appoint a commission specifically to determine the technical aspects of its distribution. (The current revenue allocation to the Green Bank in initial years is out of proportion and should be adjusted). The commission should include members representing environmental and environmental justice organizations; low-income advocacy organizations; unions; the Office of the People’s Counsel; applicable agencies; and other members with relevant expertise. The commission should report back to the Council within six months of beginning work, but at the very latest no longer than twelve months after beginning work. The economic outcome must be progressive for the majority of DC households. Households who contribute least to the climate crisis — specifically low-and middle-income households — should not pay more in a carbon fee than they receive in compensation. The price signal and the revenue must be decoupled. In other words, no one should receive revenue back at the same time that they pay the carbon fee (e.g. on-bill). The price path should be unchanged from our original proposal of $20/ton in year one, increasing $10 every year to a cap of $150/ton. The Coalition continues to believe that rebating 75% of the money to District residents in the form of monthly checks or deposits is the best use of the funds. If needed, however, we are open to a diverse commission of experts determining the specific allocation of these funds, as long as the solution is timely and adheres to the principles described above. Holy moly. 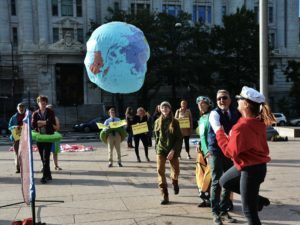 Last week, nearly 150 PEOPLE turned out to the Wilson Building to call for a price on carbon in DC. We stood alongside Councilmembers Robert White (At-Large), David Grosso (At-Large), and Charles Allen (Ward 6), as well as labor, faith, and justice advocates, who all gave compelling calls to pass this policy. Our movement is truly breaking ground. Now, we need to amp up the pressure. Will you send a quick message to your Councilmember encouraging them to introduce a carbon fee-and-rebate policy? Tell them we can’t wait — it’s time to introduce the Climate and Community Reinvestment Act. You’ll also have the opportunity to say thanks to the Councilmembers who came out to last week’s rally. On Wednesday, SEIU Local 32BJ member Judith Howell shared how pollution from idling trucks filled her apartment and sickened her lungs that very morning, calling for the carbon rebate to clean up the air. Reverend Kip Banks from the East Washington Heights Baptist Church made us laugh with tributes to Beyoncé’s lyrics “put a ring on it” and shout to put a price on pollution if we love Creation. Mike Tidwell of CCAN urged you and I to make this mission part of our daily life until we win. And of course, our champion Councilmembers all spoke passionately about why they are fighting for a carbon rebate in the District. Then we stormed the building to inspire the rest of the Council! Want to relive the excitement? Check out the coverage from NPR and teleSUR, and browse this great photo album. And I hope you’ll take a second to read the press release of the Councilmembers’ calls for action and share it with anyone skeptical that we can get this done. Our vote count estimates are getting mighty exciting. But every one of us needs to push hard until all 13 Councilmembers and Mayor are out there celebrating victory on the front steps. Take one second right now to send your Councilmembers a message of support for the carbon fee-and-rebate solution. As NPR reported, “D.C. could become one of the first jurisdictions in the country to put a tax on carbon emissions.” This is because of your focused activism. This is direct democracy in action, my friends–take the high-five and pass it on. 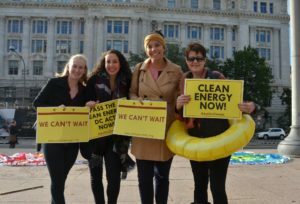 It’s time to advance precedent-setting climate protection and economic justice, right here in the District of Columbia Our proposed carbon fee-and-rebate policy would hold polluters accountable for the costs of climate change, level the playing field for clean energy, and lift up every resident of DC (that’s you!) with frequent carbon rebate checks in your bank account. Send your Councilmembers a message today! 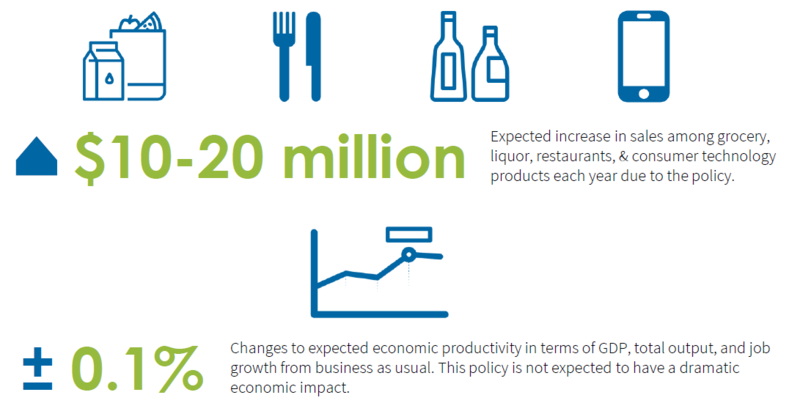 Tell them we can’t wait for strong climate action in D.C.
INFOGRAPHIC: How would our policy boost the DC economy? Guest post from DC resident Roger LeBlanc, Jr.